In early July I’ve found an Indiegogo project of a miniature Linux powered computer called VoCore. It is a RaLink RT5350 (360 MHz MIPS24KEc) based board with 8 MB SPI Flash (although Vonger, the creator of the project upgraded to a 16 MB Flash for the Indiegogo batch just because he’s a nice guy) with two 10/100 Mbps Ethernet interfaces, one USB 2.0 interface, a bunch of serial interfaces (UART, I2C, I2S, PCM, JTAG) and over 20 GPIOs. All these broken out to standard 1.27 mm connectors while keeping the size at 25×25 mm! 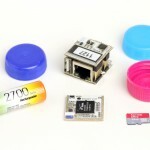 There is a dock to provide some connectors: an Ethernet, a USB, a micro USB (for the power) and a micro SD card slot – this measues 25×25 mm as well, of course. VoCore is running the OpenWRT firmware. It acts as an access point by default, running a network called “VoCore” (this is unfortunately an open network (i.e. no encryption set up) so changing security settings as soon as possible is recommended). The VoCore can be ordered from vocore.io/store. If you would like to have the VoCore main board only (with all the I/O breakouts but no connectors at all) it is USD 20, but if you’d like to have the Dock as well, plus a USB to TTL converter (note: this is missing from my pictures below!) to re-flash the firmware it is just USD 45. 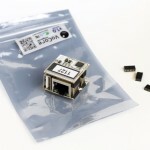 I believe that the VoCore has a lot of potential thanks to its small size (25×25 mm) its low power consumption (0.6-1.2 Watts) its flexibility (20+ GPIOs and the whole bunch of connector break outs) and low cost. I think this is a must have board for any geeks out there who have thought about hacking some hardware once in a while. Oh, and one more thing: VoCore is open source, both software and hardware. All the schematics, circuits, firmware, 3D model for the shell/case, everything is available to download from the VoCore’s site. This entry was posted in VoCore and tagged hardware, linux, vocore.